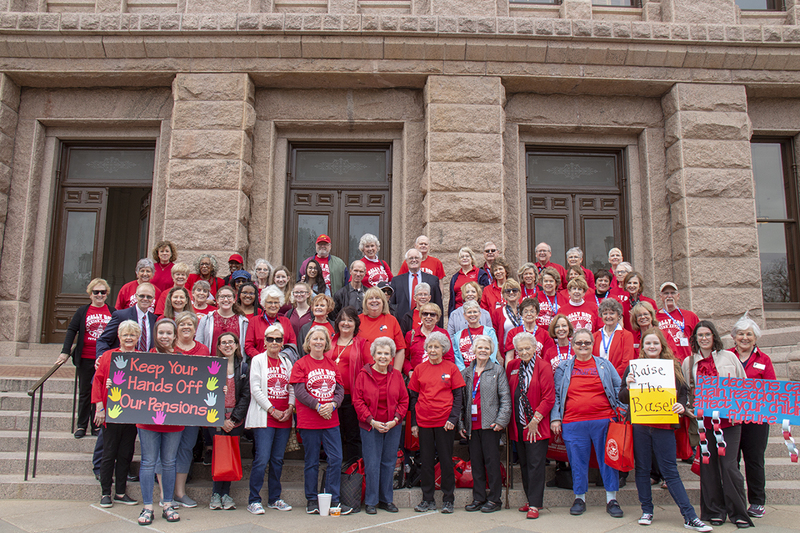 The Texas Retired Teachers Association (TRTA) held its 66thAnnual Convention this week in Austin on April 1-2, followed by a rousing day of advocacy at the Texas Capitol on April 3, where more than 1,500 TRTA members and friends convened to rally and meet with their legislators! 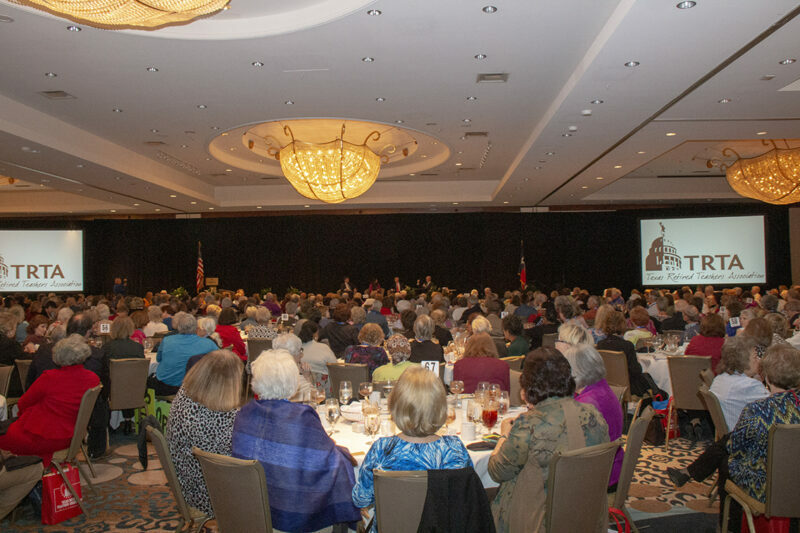 Held at the Hilton Austin, the convention was a two-day affair packed with information, including committee and officer training sessions and a productive House of Delegates meeting. TRTA will provide a full update on bylaws amendments in second quarter issue of The VOICE. 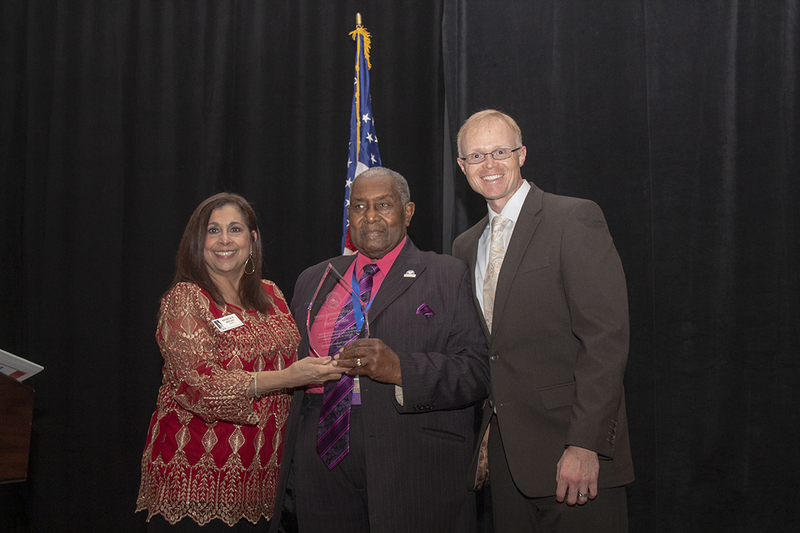 Carlos Ortiz was recognized for his service to TRTF during the luncheon by TRTF President Jamie Larson and Executive Director Tim Lee. 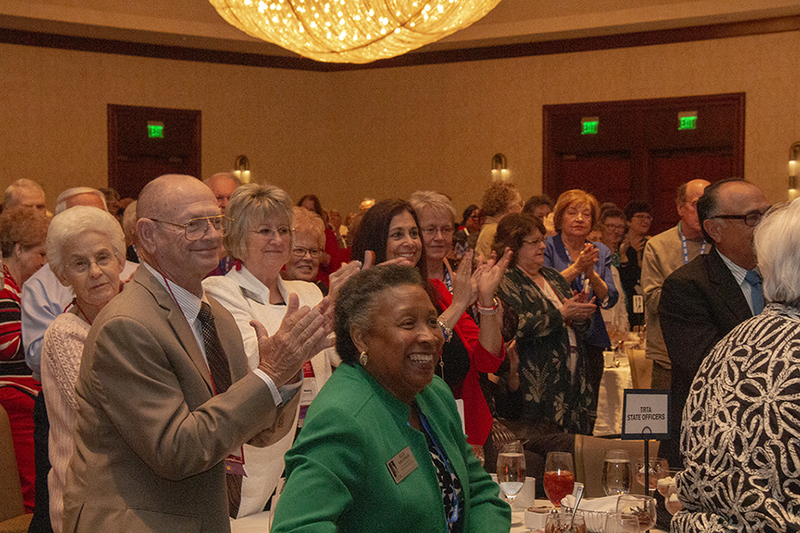 During a fundraising breakfast for TRTA’s charitable partner, the Texas Retired Teachers Foundation (TRTF), TRTA districts, local units and members donated more than $17,000! A video honoring former TRTA Executive Director and TRTF Board Trustee Mike Lehr was also aired for all attendees. Also at the breakfast, TRTF announced its 2019 Beginning Teacher Scholarship and Classroom Assistance Grant recipients. Click the links below to read the names of all the winners. Former TRTA State President Herbert Norris was presented with this year’s prestigious E.L. Galyean Service Award for his many years of dedicated service to TRTA at both the state and local levels. 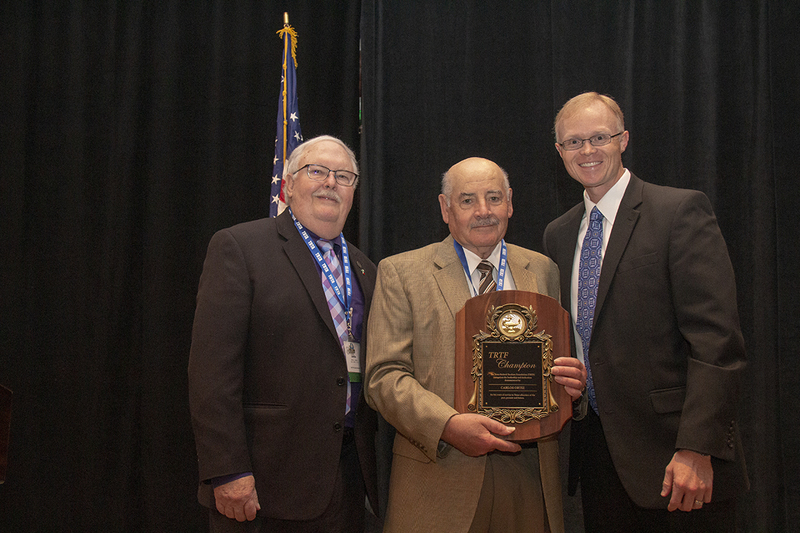 Herbert Norris accepts the E.L. Galyean award from President Pat Macias and Executive Director Tim Lee. 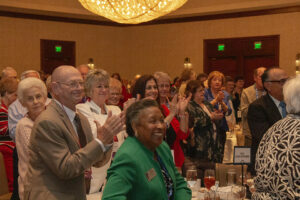 TRTA’s officers and audience members show their appreciation for the legislators at the luncheon. 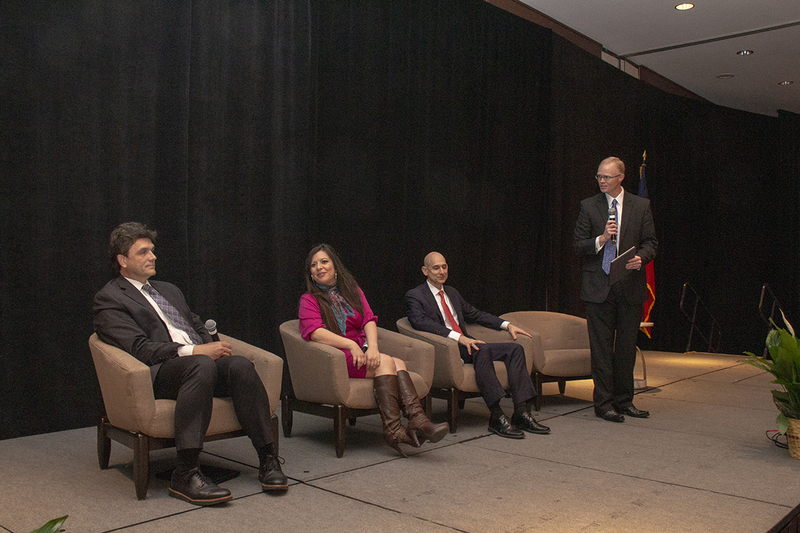 From left to right: TRS Executive Director Brian Guthrie, Rep. Mary González (D – Clint), Rep. Greg Bonnen (R – Friendswood) and TRTA Executive Director Tim Lee. On Tuesday, April 1, TRTA held a well-attended legislative luncheon, featuring a panel led by TRTA Executive Director Tim Lee. 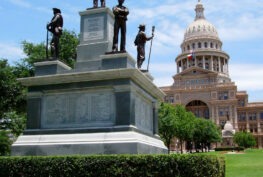 Lee started the program, by discussing the current state of the Teacher Retirement System of Texas (TRS) pension fund with TRS Executive Director Brian Guthrie. Representative Greg Bonnen, Chairman of the House Appropriations Subcommittee on Article III and author of House Bill 9 (the House’s version of the TRS pension fund actuarial soundness bill) also appeared on the legislative luncheon panel, along with Representative Mary Gonzalez, a member of the same subcommittee. 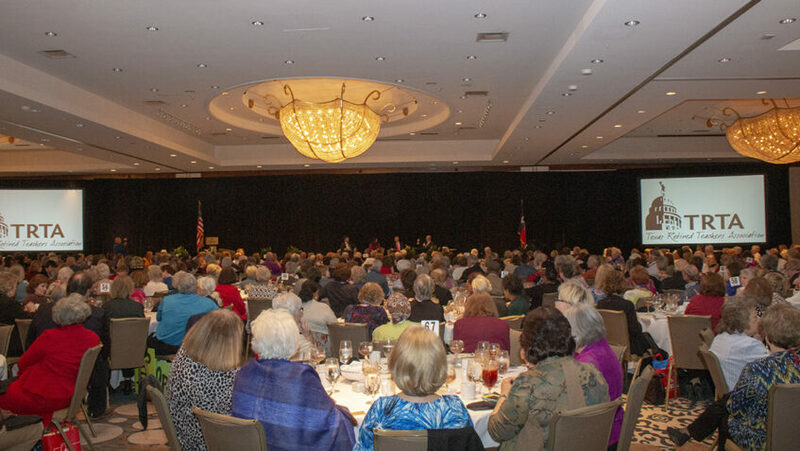 The luncheon gave members the opportunity to hear directly from legislative leaders who are working to establish a long-term funding plan for the pension fund so that the system can become solvent. Until the pension fund becomes actuarially sound, the system cannot provide cost-of-living increases to annuitants due to state law. TRTA District 10 celebrates a successful Day at the Capitol on the east lawn’s steps. Throughout the day, retirees were honored with proclamations in both the House and the Senate and set up meetings with hundreds of legislators. At noon, hundreds of retirees gathered at the TRTA tent on the east lawn for a rousing rally and heard from multiple legislators. TRTA wishes to thank all those legislators who took time out their very busy schedules to speak publicly to our members and meet with them one-on-one. 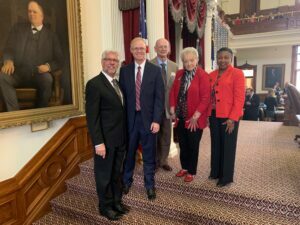 Rep. Lynn Stucky (R – Denton) welcomes Tim Lee, Leroy DeHaven, Tonna Duke and Ella Gauthier to the House floor. During the rally, TRTA was honored to share the platform with Representative Ron Reynolds, Representative Shawn Thierry, Representative Tony Tinderholt, Representative Phil Stephenson, Representative Ana-Maria Ramos, and Representative Carl Sherman. A staff member from Representative Kyle Biedermann’s office also addressed the crowd. Legislators and their staff also joined members on the east lawn for an ice cream social featuring local favorite Amy’s Ice Cream. 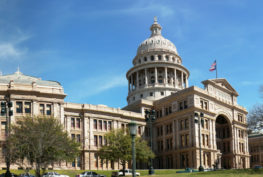 Members, if your legislator took the time to meet with you or join us on the east lawn during Day at the Capitol, please be sure to send a handwritten thank you note or give them a phone call to let them know you appreciate their support. 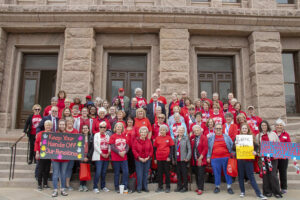 Our Day at the Capitol event made a huge impression and put hundreds of faces to the very real and challenging issues that face Texas public education retirees today. 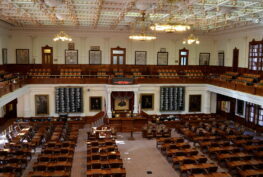 TRTA is making progress in both the House and the Senate on various legislative agenda items, and we must continue communicating with our legislators about the importance of retirement security for all current and future public education retirees. 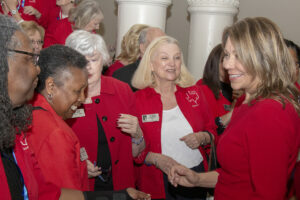 Sen. Joan Huffman (R – Houston) meets with TRTA members outside of the Senate chamber. 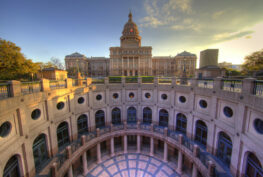 Thank you to each and every member of TRTA for his or her participation in our convention and Day at the Capitol. Your presence was felt whether you were able to be here in person or participated from home. Thank you to those of you who made phone calls and sent emails, reminding legislators to #RAISETHEBASE!